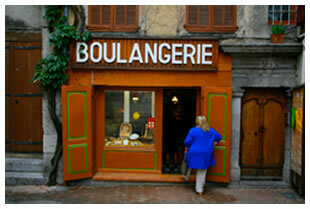 Nearly everything about the Aude,Languedoc,France: What's happening to the French Baguette? What's happening to the French Baguette? I am contemplating about the joys and tribulations of looking for Property for Sale in the Aude, Languedoc, south of France, drinking strong black coffee and eating a crispy piece of baguette smothered in apricot jam. I had been in the local bar in Argens Minervois the previous evening, and had overheard a heated debate on the sad future of the French Baguette. I decided to investigate further, and here are my findings. France eats approximately 30 million baguettes a day. Wow (that’s a half a baguette for everyone every day). So do you think nothing’s special about France’s baguettes? If that’s how you feel, you’ve never had a REAL baguette. The kind kings, queens and regular people like me dream about when away from France. You can detect the REAL baguette immediately: the extra light and crispy on the outside, soft, luscious, perfectly cooked, fluffy light bread on the inside, and what’s more, it tastes so good; no blandness, no tough (rip your teeth out) tennis shoe sole posing as food. The real baguette is a small pleasure and a huge part of French culture, that many people take for granted - and this perfect slice of French life is slowly disappearing. Those last two words should NEVER go together. This was having a devastating effect on the independent boulangers, who would find it more and more difficult to compete with the rock bottom prices of the supermarkets. Enter stage right: Banette. Don’t be fooled by the signs that say Banette, artisan boulanger. If there’s a Banette sign outside the bakery like in the picture, it’s bread from industrial frozen dough. Banette solved many problems for the struggling Indie baker: less labor, comparable prices to the chains. A win-win situation? Me thinks NON! (shaking fist) At least not for the consumer. Now, I’m not saying bread made with Banette frozen dough is poison; it’s ok bread (just ok and on the mediocre side) — it’s just not the bread to which I am accustomed and it’s not one that I merit. I have a discerning palate and I want a REAL baguette. I live in France and I want a real baguette!!! Luckily, my tantrum is not permanent (for now) because not all bakers joined the Banette camp, though a LOT of them have, sadly. Take notice (and do find the real deal), because this is what will happen if no one cares: Consumers’ indifference will spread slowly but surely like the dark evil of the black plague, filling up on the industrial so-called baguette - and then the frozen Belly of Banette will burst and ooze at the seams while more and more bakers join the Banette bandwagon to survive. The real baguette will be harder and harder to find and at some point, be impossible to find - because it no longer exists. What a sad story! Now that is off my chest! I must call my Estate Agent to see if any new houses have come for Sale in my newly discovered part of the Aude, Languedoc.